The new year is right around the corner, which means it’s time to rev up your real estate business! What does 2017 look like in regards to mortgage rates, home values, and inventory? Real estate experts weigh in. 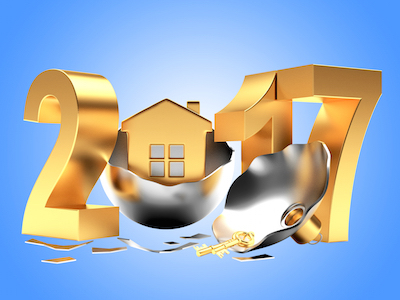 According to recent forecasts from the National Association of REALTORS®, the Mortgage Bankers’ Association, Freddie Mac and Fannie Mae, we can expect a big influx of home sales in 2017. “NAR is predicting existing-home sales to reach 6 million in 2017, higher than its 5.8 million forecast for this year,” a recent article reports, “MBA is predicting home sales to eclipse 6.5 million next year, which Fannie Mae and Freddie Mac are both predicting 6.2 million. With a prosperous real estate year ahead, it’s time to get your marketing strategies in order. When you place an advertisement in Homes & Land magazine, you’ll also receive a package of features and benefits designed to increase your online exposure! When it comes to selling a home during the winter season, staging is crucial. A recent article in REALTOR® Magazine sheds some light on the most important home staging elements to utilize during an open house. In this post, you’ll learn everything you need to know about curb appeal, suitable holiday decor, incorporating color, and creating warmth with lighting. Conducting brainstorming sessions with your colleagues is a great way to come up with new ideas, but you’re only scratching the surface. Try these ten exercises to supercharge your creativity and innovation!